Little did I know that this was to be the longest morning of my commercial culinary career. The following takes place between 6:21 and 7:43 AM. As I walked up to the table I realized that I had waited on them before, though I couldn’t remember if it was a pleasant or a vexing visit. It was a couple in their mid-50s. In as genuinely a country fresh tone as I could muster at 6:21, Hello folks, ready for a Rise’n Shine breakfast with some Momma’s pancakes? Ignoring this opening salvo, I take their drink order: "COFFEE, BLACK, No Cream, don’t bring us any cream; If you bring us any cream we will throw it back at you; We don’t drink cream;"
After the black coffee is served and then taken back because it is too black, I bring back the same coffee with a little water and stir-job: “mmmhhh, this is what I’m talking about.” As I’m about to take their order, Grandma’s husband in a tone of aggravation: “Son, do you not serve half and half with your coffee any more?” Well, actually Sir, you made it abundantly clear that you were adverse to any form of cream. 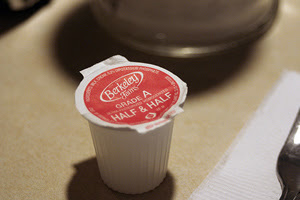 (Yes, I did use the words abundantly and adverse) “No, no, I didn’t want any cream, we DO need some half and half though! All right, are we all good on coffee? What’s that? You’ve been ready to order for 20 minutes? All right, what can I get for ya’ll this lovely, happy, chipper morning? 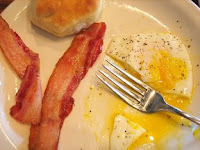 They order two Old Timer’s (indicatively) breakfasts with crisp bacon, not too runny eggs, and no set-up. Yes sir, I heard you: No set-up. What’s that? You really don’t want the set-up; no set-up; you will not eat it; I will be forced to take it back; No set-up; Okay sir, I think I’ve got it. Yes Sir, I did write it down and I will tell the cooks. Mean Ched: Ched what are you doing? Benevolent Ched: What do you mean, “what are you doing?” I mean, why are you giving them good service? Because I’m a 4-Star waiter and our motto is “pleasing people.” Don’t give me that load of hooey. I saw you serve them the half-and-half that was wedged under the coffee maker from last weekend! That was an honest, working man’s mistake. Rubbish. Well… Come on, you know you want to “modify” those eggs. Just a little horse radish will do the trick. Or, You know very well that hair follicles when cut up just right look like pepper flakes. No, get thee behind me! They were just having a bad day, they won’t give me anymore trouble. I'm sure of it. I’ve got principles. 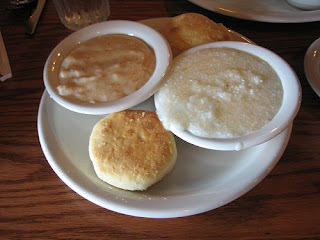 [Background: A set-up comes with every breakfast that we serve and consists of a little bowl of gravy, a little bowl of grits and two biscuits. This is very clear from the menu.] I’m sorry Sir. The reason I didn’t bring you any biscuits is because you asked me not to. 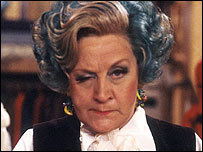 You said that you did not want the set-ups that came with the meal. Well, we don’t want the set-up, but we want the biscuits. I never told you I didn’t want biscuits, I told you I didn’t want a set up! Epilogue: 20 minutes after these encounters, the waitress in the section next to mine drops a maple syrup bottle which shatters into hundreds of syrupy pieces, one of which gets allegedly lodged in between Cranky Breakfast lady’s foot and sandal. She calls the manager over, says she’s bleeding. The meals are now on the house, and Ched who has persevered to the end of this ordeal walks away with empty, sticky hands ( I had to clean up the syrup). Missed the Previous Memoirs? Don't Fret! 2. First in Line, Last to Leave!